So when I read the Title and the Synopsis of the book it immediately reminded me of the TV show “Once Upon a Time” (which I love by the way) and it actually turned out to be kind of similar to it. Yay! The whole story takes place in this town where everyone has some kind of a fairy tale ancestor. Like tooth fairies and friggin’ Santa Claus! It was really super cute! 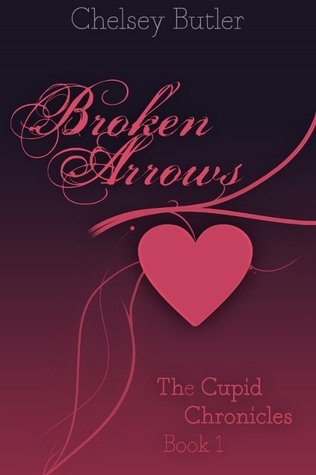 Cari, our protagonist, is the daughter of Cupid. So her job is to see the aura between couples and bring them together. Unfortunately she seems to be a bit too clumsy to do the job and we follow her as she’s trying to fix one of her spells gone wrong, while managing her guests at the inn she owns, trying to find time for her family and friends and dealing with her ex boyfriend who just came back to town. Cari’s character was my favorite part of the book. She’s so relate-able and she has the best job ever! She runs a little inn in a cute little town. Seriously this books is so so cute! I could honestly describe it in this one word. So, back to Cari. She’s also incredibly funny and I couldn’t help but laugh at her clumsiness and all the things going wrong. I liked how she tried to figure everything out and make everything right again. I also loved how much she cared about everyone and tried to bring other people together. The story of the book is quite interesting. I couldn’t figure out who the love interest was going to be. We have the ex boyfriend who came back to town after having left Cari some years ago to go study and then we have the guest in the inn who has accidentally fallen head over heals for Cari. I wouldn’t characterize it as a love triangle, though, as Cari didn’t seem to care about any of them at first, so that’s the only reason I was a bit confused. It was an interesting sort of situation and all of that during a mystery theme weekend with the inn being full of guests and people trying to solve the “mystery”. This book is very short (only 170 pages) and I actually think it could use a few more. Especially in the ending. The ending of the book was actually a downside for me mainly because it was so abrupt. I was actually asking myself if there were a couple of pages missing (Lol). I would definitely like to find out what happens next and I will be anxiously awaiting the sequel. So to sum it all up, I really loved the main idea behind the book and the character of the protagonist. I would like for the book to be a bit longer so that I could get to know the characters a bit better and become more invested in the story. But I’m looking forward to the sequel and how the story will continue from there. Did I mention this is a series? It’s called “The Cupid Chronicles”. How cute is that?